Hundreds of business, labor union, and government representatives from International Labour Organization member countries are meeting in Geneva, Switzerland for the annual International Labour Conference in June. The goal of the U.N. agency’s forum this year is to create a global standard to address gender-based violence in the workplace. To aid this discussion, Global Labor Justice, the Asia Floor Wage Alliance, and other partners have compiled reports detailing gender-based violence across factories in Walmart’s garment supply chain in Asia. Researchers found a wide spectrum of gender-based violence in the factories that produce clothing for Walmart. In Bangladesh, a factory boss subjected an employee named Sulatana to months of harassment, then fired her for refusing to date him. Local police refused to open a case file on her behalf. Those who assemble clothes for a Bangladeshi Walmart suppliers argue that a complaint box for employees that is overseen by someone paid directly by the factory manager is “useless” and complaints are not taken seriously. In Cambodia, women reported beatings at the hands of their male co-workers, as well as by factory management. Violence also comes in the form of depriving these women of fundamental workplace rights, such as lunch breaks and overtime pay. At least 500 Cambodian garment workers fainted on production lines in 2017 because their bosses forced them to work overtime during the hottest season of the year while providing little access to water. Walmart is no stranger to complaints from women who work for the retail giant. The company was the subject of the largest class-action lawsuit in U.S. history, brought about by 1.6 million associates who alleged the retailer of limiting the pay and promotional opportunities for women. Respect the Bump, a grassroots group started by current and former Walmart personnel achieved marked improvements for pregnant Walmart employees while calling out the company on its violations of the Family and Medical Leave Act. 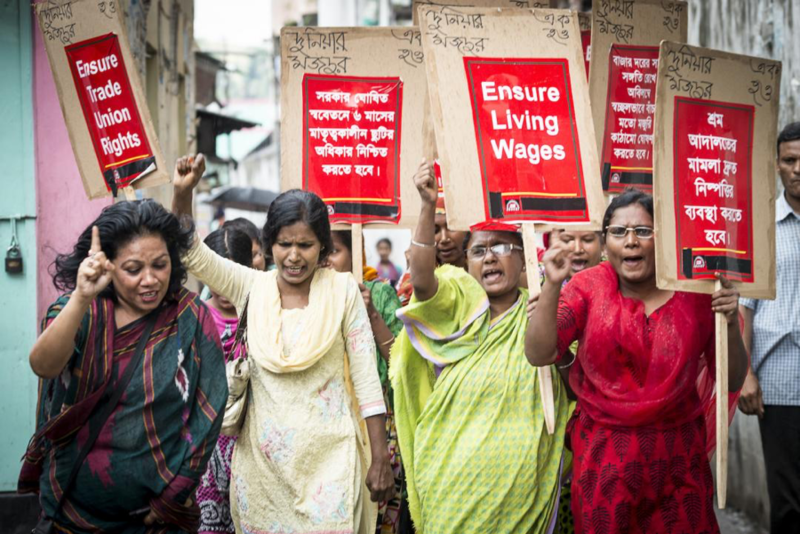 Global Labor Justice and Asia Floor Wage Alliance have developed a list of recommendations Walmart should adopt and implement to begin making things right with women who work for them in any capacity. To ensure Walmart’s compliance, they argue the corporation needs to respect the right for the women producing clothes for their stores to join together in union. The groups also requested that Walmart representatives meet with the Asia Floor Wage Alliance Women’s Committee (made up of women who work in factories in each of the countries involved) within three months to create remedies on the factory floor. Walmart has the means to use its power to benefit the working people who make and sell its apparel — the overwhelming amount who are women. Walmart has a responsibility to each of these women to make their workplaces respectful, dignified, and free from violence and discrimination. You can help press the company to end gender-based violence within its supply chain by signing this petition to Walmart.